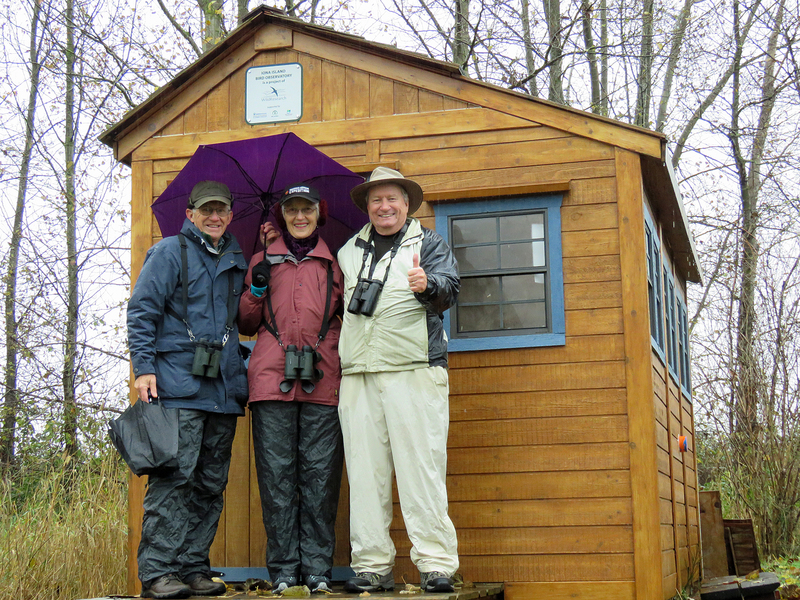 It was another miserable Tuesday so only three of us battled the rain at Iona Regional Park. And, as always happens, it was a very enjoyable and almost comfortable outing, with lots of brilliant sightings. Check out David’s photos on our Flickr site at: www.flickr.com/groups/dncb, then click the magnifying glass icon in the “Photo Pool” row, and add 2017-46 to “ DNCB Photos” in the Search box at the top of the page. David Hoar & Noreen Rudd with Mike Betts were waiting at Petra’s when I arrived at 7:20 am. It was pouring rain, and the forecast was for rain all day. I had been cooped up indoors for a couple of days so was keen to go despite the weather. Mike decided to go to “work” instead. So David chauffeured Noreen and me through the usual horrendous rush hour traffic to the Iona RP parking lot. We got there about 8:40 am, and there wasn’t a soul around. Except a mature Bald Eagle that landed beside the car and scooped up a Snake and carried it off to the Eagle Tree on the other side of the pond by the sewage lagoons. We fumbled getting out of the vehicle, so didn’t get photos. We walked to the beach; the tide was very high so nothing on shore. Surprisingly, no rafts of waterfowl on the water either, only a couple of Common Loons and Cormorants. As we walked back to enter the park trail, a Peregrine Falcon landed in the parking lot tree and posed for us. Then on the main pond we noticed a diving Canvasback (neat sighting too). Three other “divers” were with the Canvasback, and we think they were Scaup species. As we entered the park trail the regular “little birds” were flitting in the bushes, but not posing as the rain pushed them deep into the shrubbery. We saw, Song, Fox and Golden-crowned Sparrows, Spotted Towhees, House Finches, Juncos, etc. A small flock of perhaps Red Crossbills flew by above us (Noreen recognized the call). The north pond was interesting with a group of Ring-necked Ducks among the Gadwall, American Coots and American Wigeon. I think we saw the Pied-billed Grebe between the rain drops on my bins. Another diving duck was unidentifiable, however, on the way out we searched for it again, and got great views and photos of a Ruddy Duck. We’re persistent DNCBers. David took the obligatory Group Photo as we three stood in front of the Bird Observatory building where Wild Research band birds. We entered the back gate to the sewage ponds and the first south west pond was full of Northern Shovelers, Northern Pintail and American Wigeon, and a few Green-winged Teal (Mew Gulls too). Dunlin were scattered in all the ponds feeding in the mud. We saw a few Peeps with them, Western Sandpipers, we think, and a couple of other sandpipers which may have been a Spotted and/or Pectoral Sandpiper. Several Long-billed Dowitchers there too, all up-close-and-personal for photos, but we couldn’t confirm that we saw the Sharp-tailed Sandpiper that has been regularly seen in these ponds. Along the path between the ponds were mixed flocks of hundreds of European Starlings and Red-winged Blackbirds. We picked out a few Brewer’s Blackbirds, and Noreen saw the Rusty Blackbird, but we didn’t get a photo. Six Great-blue Herons weren’t bothered by us as they wandered with us along the path. We wandered right to the back (really the front) pond and spotted a Scaup among the Pintails. Then, on closer examination, there were more than a dozen Lesser Scaup there. We searched for other different species among the hundreds of waterfowl and shorebirds in the ponds, but didn’t catch anything unusual. We heard Marsh Wrens buzzing in a bush right in front of us, but they wouldn’t pop out to see. A flock of Snow Geese circled us and flew right into David’s face. Noreen prayed that no white-wash would fall as they passed above. We exited the back gate, and before leaving the park, checked out the Canvasback again in the front pond where a pair of Hooded Mergansers was also diving. It was already Noon, the time seemed to whizz by, and we were starving. We decided to return to Tsawwassen and have lunch at the Rose & Crown Pub. As we left the park, the tide was receding, and there were hundreds of Dunlin and Black-bellied Plovers feeding on the shore very close to the road, and us, with muddy-faced Snow Geese. We would have liked to stop here longer, but our stomachs were grumbling. Our Lunch Specials in the R&C Pub, Vege Soup & Sandwich (mine was Bacon & Egg, of course with a pint of Canadian), were hot and delicious, with Leila’s superb service. We bonded and warmed up nicely and I learned a helluva lot about Genetic Health Care. I was home by 2:00 pm, with the Avocados, Milk & Bread as ordered, and in plenty of time to pick up granddaughter Juliette at school at 3:00. Next Tuesday, November 28, we will leave Petra’s at 7:30 am for Burnaby Lake Park, meeting in the Park parking lot by the Nature House around 8:30 am. Our Burnaby Lake guru Roger Meyer will lead this outing. This entry was posted in *DNCB, Bald Eagle, Black-bellied Plover, Canvasback, Dunlin, Hooded Merganser, Iona, Long-billed Dowitcher, Pectoral Sandpiper, Peregrine Falcon, Pied-billed Grebe, Red Crossbill, Ring-necked Duck, Ruddy Duck, Rusty Blackbird, Sewage Lagoons, Spotted Sandpiper, Western Sandpiper. Bookmark the permalink.